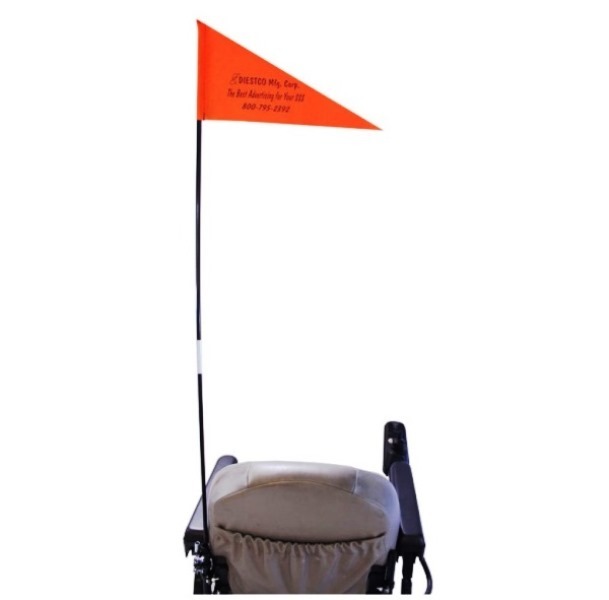 Folding Wheelchair Safety Flag extended position. Bright orange flag with reflective trim increases safety and visibility for mobility aid users. 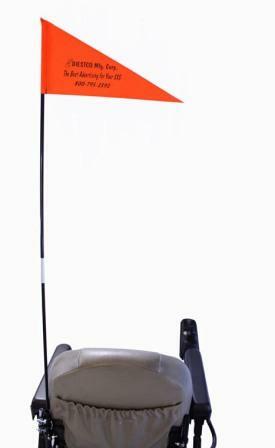 The Folding Wheelchair Safety Flag is a bright colored flag and pole that easily attaches to a mobility aid. 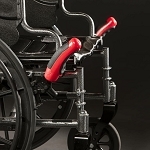 The flag includes mounting hardware to easily attach to most scooters, manual wheelchairs, and powerchairs. 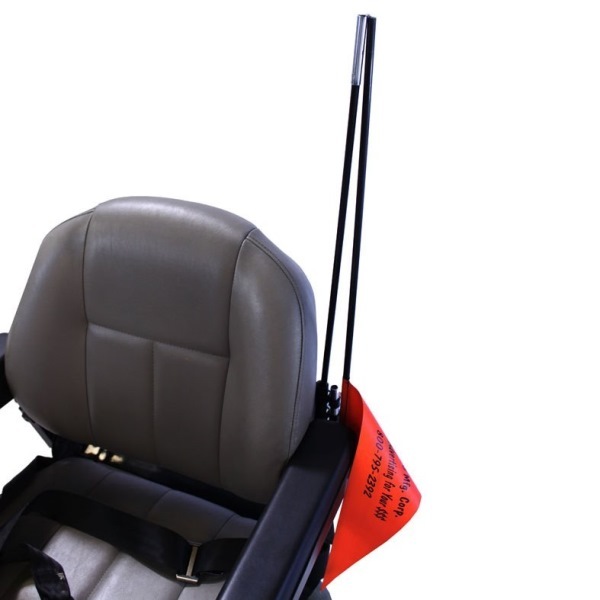 The Folding Wheelchair Safety Flag has a shaft that folds in half for easy storage when not in use, or when getting in and out of a vehicle. 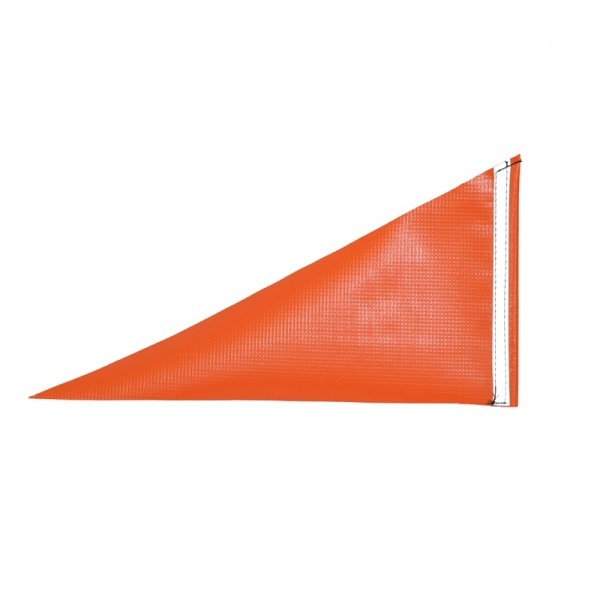 The bright orange flag has 300-yard reflective safety tape stitched on the seam. 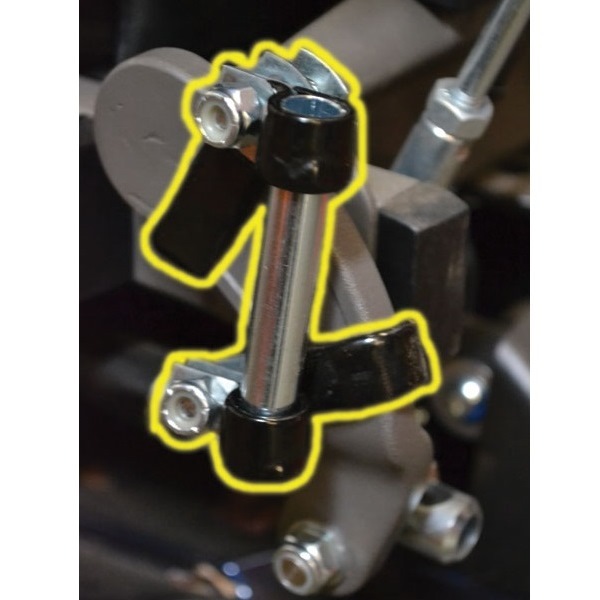 The mounting kit includes square and round clamps for mounting to square or round tubing. 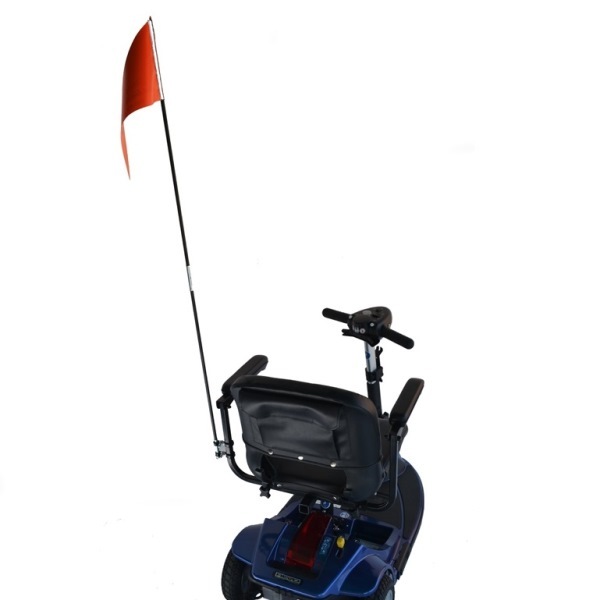 The Folding Wheelchair Safety Flag helps to increase visibility for wheelchair and scooter users. Folding Wheelchair Safety Flag replacement flags, replacement poles, and replacement mounting kits are available. Kit includes: 2-3/4 inch square-clamps, 2-7/8 inch round-clamps and 2-1/4 inch x 1 inch bolts. Pole measures: 51 inches tall fully extended, 26.5 inches tall when folded. Flag measures: 7 inches tall, 14.5 inches long. Materials: Vinyl flag, fiberglass pole. About the Seller: Placed my order, notified it was shipped. The item arrived sooner than I expected with all items needed to attaché it to my scooter! I was pleasantly surprised and thrilled with the time frame for shipping and receiving and the item itself. Great service! About the flag: The flag itself took me about 20 minutes to install. I am 68, female and don''t have much strength, so that was fast. If my daughter had been around and was the one to do it. It may have been a 10 minute job... Very easy to attach to my scooter! I foresaw one problem when I ordered it....color, I don''t like orange. While waiting for the flag I made a new one to replace the one coming. I now have a crazy patch sequined flag of various colors! Have had many compliments and questions as to where I got it. I tell them on line and the company, but also explain it comes with an orange flag! One suggestion to the company..it should be offered in a variety of neon colors. Yellow & lime green are the 2 most visible colors in any kind of weather, including fog! Safety first... Thank you for your service! 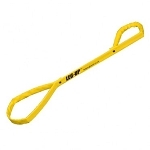 The Safety Flag which I ordered for my mobility scooter arrived much faster than I had expected and included a variety of clamps which assured me of having the correct ones for my scooter (eliminating my having to shop for them). Though I could have done so myself, my son-in-law generously took on the project and attached the clamps and hoisted the flag. "VOILA"! And an added handy feature is the rod for the flag has a release mechanism, so it can be folded in half--which is a nice feature when in a store shopping as well as when having to "park" it in my apartment. My thanks and appreciation go out to Mobility-Aids and the Staff. We got our order! It''s brand new and in excellent condition! 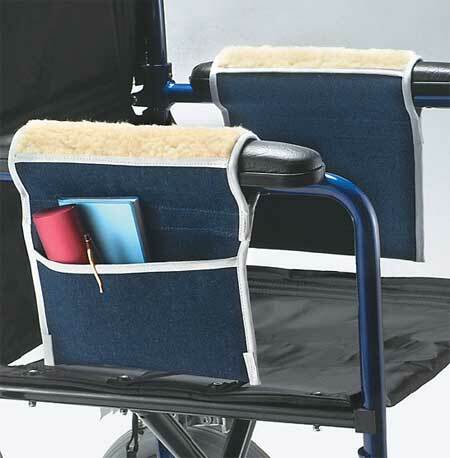 It was placed on my husbands Power Wheelchair and he absolutely loves it! Thank you so much! Great product at reasonable price. Different hardware to adapt to square or round tubing. Easy to assemble. A: The shaft is fiberglass, the flag is a mesh covered plastic. Orange. No other flags are currently available, however I would imagine you could easily make one yourself and slip it over the shaft. 51 inches tall fully extended and 26.5 inches tall when folded. 7 inches tall by 14.5 inches long. Q: Do ALL of the safety flags have your advertising on them? I would like one without it. A: We do not have advertising on our flags. Q: Sorry, I see most of my questions were answered in the description part of the item. I didn't scroll down far enough. I still need to know how the flag is attached to the poll. My scooter is red and black and just wish I could get a red or USA flag to fit. Do you have any other flags to fit this poll? A: A pocket is sewn into the flag and the flag simply slips over the shaft and a little glue holds it on. No other flags are available at this time. As stated before, to use your own flag you could probably sew a pocket onto a flag for the shaft to slide into and glue it in place. Q: How tall is the flag in it's entirety? Can I attach one to each side of my electric wheelchair to ensure I am clearly seen when driving on the side of the road & in large parking lots? Does the flag fold in half at the middle of the flag pole? Is it possible to make it fairly secure as an anti-theft measure? (Especially considering that each flag will cost me $20 + each?) Since you only have 12 in stock, are the chances pretty good that I will be able to order two flags? THANK YOU IN ADVANCE FOR YOUR ASSISTANCE IN THESE QUESTIONS!!! A: The flag pole is 51 inches tall. 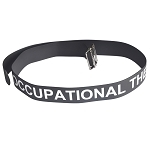 Yes, with the universal kit that is included you could attach it in a variety of locations. Yes, the flag folds in the middle, the top half slips out of the little metal sleeve. For security, you could try using an epoxy to keep the flag pole secured in the base. Our inventory levels vary daily, in the event that we are out when you order if you go ahead and place the order we will ship them to you once they are back in stock. A: Correct, both round and square mounts are included so the flag pole can be mounted on a variety of scooters/wheelchairs. Q: How long are the flag sections? A: Each section is 26.5" long. Total flag pole length is 51" because the top section slides into a sleeve on the bottom section. Q: when folded, how far does the flag bar stick up from the wheelchair back? A: That would depend on how high/low you want/have to mount the flag pole. The flag pole is 26.5 inches tall when folded, so measure up 26.5 inches from where you plan on mounting the flag to get an idea for your application. Q: Is there a warranty and free return shipping? A: The manufacturer has a 90 day warranty against manufacturing defects. No, customers are responsible for return shipping. Q: Do yo have any Handicapped flags that I could attach to my trike? A: You could try this one...you might have to make your own mounting clamp though. We do not carry any specifically for a trike. Q: Can the flag be printed PMS 2945C Blue with white logo knocked out? 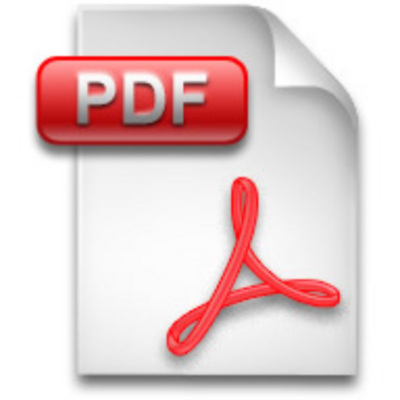 A: No, we don't have any type of Printing Services for this product.